I've been swamped with Untappd badges recently so am going to have to do another of these little catchup reviews. Exams are finally over though so hopefully now I'll be able to keep up with beer reviewing and forget about tax laws for a while! The Witch's Brew badge was acquired for checking into a beer on Halloween. I had a really big session that night but the first beer and the one that unlocked this badge was Rogue's Dad's Little Helper, an awesome Black IPA that available at Dan's for something like $8 a bomber! Great value! International Stout Day 2013 is today, November 8. To get this one simply check in to any stout before midnight in your timezone. 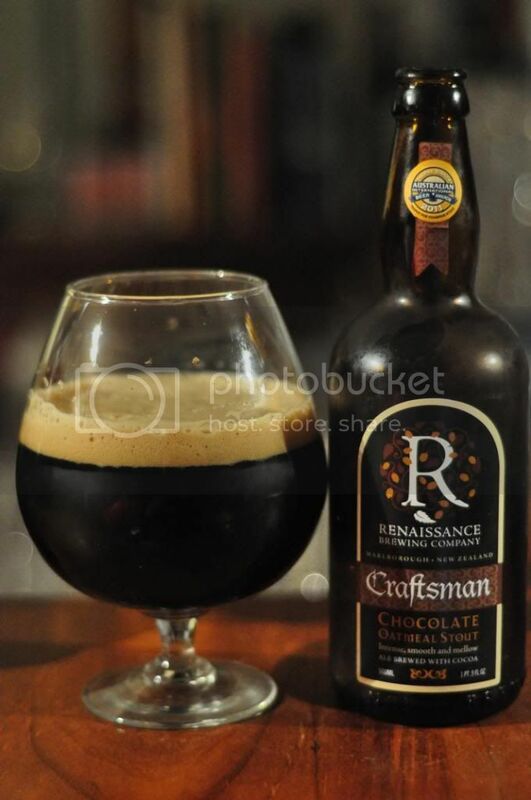 Right now I'm drinking one of my all time favourite stouts; Renaissance Craftsman Oatmeal Stout. It's a very hard stout to get your hands on but if you can it's definitely worth the effort. It's worth it just for the amazing creamy mouthfeel! I unlocked one of the badges with one of the worst beers I've had in a long time. Brass Belgium Lager is a really cheap and nasty lager which is available at Dan Murphy's in PLASTIC, yes plastic bottles! You'd think that should have warned me off but curiosity got the better of me; don't let it get the better of you! At least is unlocked the Belgian Holiday (Level 5) for me. On a similar note I had a Red Angus Pilsner that unlocked the new Crisp as Day badge. This one is simple enough to get, just drink 5 different pilsners. Anyway this was a real disappointment to me, I used to really rate this beer but the one I had tasted more like a macro lager than a craft pilsner. I don't know if this was just a bad batch or if the quality has just dropped off badly. Does anyone have any info on this? Again I'm going to hold a badge back because it's a beer that deserves reviewing. I'll give you a hint as to what badge it is though; it's one I feel I should have got a long time ago! Again this was a really long sort of rambling post so I apologize for that. Keep the beer suggestions flooding in; I really enjoy the challenge of tracking them down, the more obscure the better!